PDQ is proud to announce our latest partnership with our good friend and brand ambassador, WWE superstar Titus O’Neil. 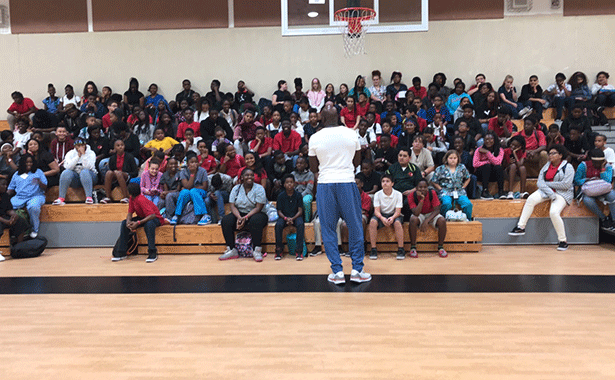 Along with his Bullard Family Foundation, and Unsigned Preps we are joining the party to celebrate students and their birthdays at both Sligh Middle School and Pepin Academy in Tampa, Florida. From September 2018 through May 2019, students celebrating a birthday each month will receive PDQ’s famous hand-breaded chicken tenders, chips, fresh-baked cookies, and homemade sauces, in addition to a special birthday cake provided by O’Neil. The Champions of Character Birthday Parties initiative originated from O’Neil’s own childhood experience of not having any birthday parties of his own. Sensing that there might be youth in the public school system in similar situations, he decided to partner with Hillsborough County School District, Unsigned Preps and PDQ to begin hosting birthday parties, starting with Sligh Middle School and Pepin Academy. The birthday parties will be held on the third Wednesday of each month to celebrate students with a birthday in that given month and two parties will be held in May for summer birthdays. Students who display great character, have perfect attendance and show grade improvement will also be invited to each month’s party.